13 July 2011: Cameron House on Loch Lomond has partnered with nearby Glengoyne Distillery to offer a new Whisky Afternoon Tea. Created by new Head Chef Ryan Neill, the afternoon tea is designed to appeal to men, with a selection of savoury, carnivorous Scottish favourites served with Glengoyne whisky and a mug of tea on a slate spread. This is a more masculine alternative to the traditional Champagne afternoon tea, which typically includes light, dainty sandwiches and sweeter treats arranged on a tiered stand with tea served in delicate bone china. Dating back to 1840, afternoon tea has long been considered the preserve of women. Now men too can enjoy this tradition with a fine menu of Rare Roast Beef and Arran Mustard Sandwiches, Haggis Sausage Roll, John Ross Smoked Salmon roll, Mini Aberdeen Angus Burger, Black Pudding Scotch Egg, Glengoyne Whisky Fruit Cake and a 10 Years Old Glengoyne Whisky Miniature. Served in the refined setting of the hotel’s Whisky Bar, the Glengoyne Whisky Afternoon Tea is available daily from 2-5pm for £26 per person. Glengoyne is one of the world’s leading malt whiskies, distilled more slowly than any other Scotch and matured in sherry-seasoned oak casks. Its 10 Years Old, made with air-dried barley, is warming with a nutty aroma. The clean taste of grass and green apple with a hint of sweet liquorice gives way to linseed oil and almond, with a sweet and malty finish. Cameron House is an ideal base for a visit to Glengoyne Distillery, which opened in 1833 – the same decade that afternoon tea was made fashionable by the Duchess of Bedford, and offers a wide range of tasting tours and masterclasses. The distillery is situated in a wooded valley with a picturesque waterfall that flows into Loch Lomond. Cameron House is a five-star resort located on the bonnie banks of one of Scotland’s most famous natural attractions, with mountain views across the loch to the breathtaking Ben Lomond. Just 30 minutes from Glasgow but a world away from the buzz of the city with Loch Lomond and The Trossachs National Park unfurling on its doorstep, the resort offers luxury, friendly Scottish service and a variety of ways to enjoy a visit, including The Carrick on Loch Lomond, a 71-par championship course with nine holes in the lowlands and nine in the highlands. The stylish interior combines contemporary design and quirky details with classic touches from Scotland’s baronial past. 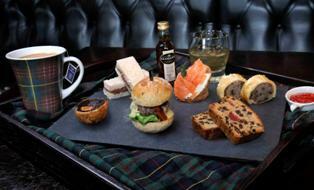 To book a Glengoyne Whisky Afternoon Tea, please telephone the Whisky Bar at Cameron House on 01389 722 581.